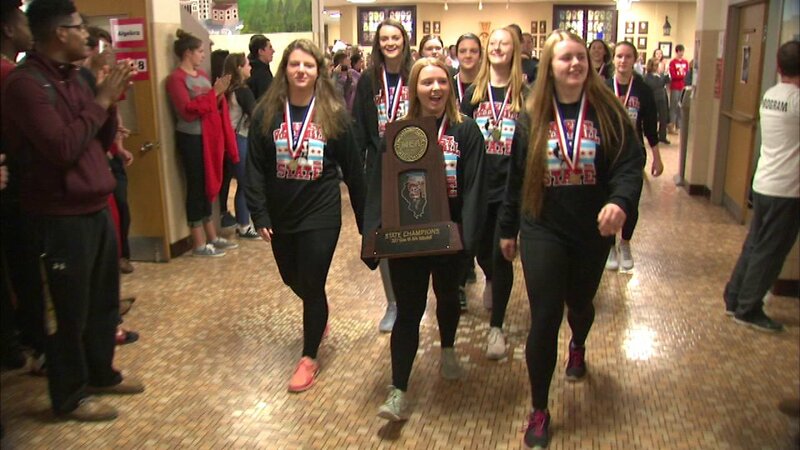 The Marist High School girls volleyball team took a victory lap at the school on Nov. 13, 2017 after winning the Class 4A state championship. CHICAGO (WLS) -- The Marist High School girls volleyball team won the Class 4A state championship Saturday - for the first time ever. Marist, located in Chicago's Mount Greenwood neighborhood, beat out Minooka Community High School in Grundy County. Marist also beat Central High School in Crystal Lake in the playoffs. Monday morning, the school held a celebration for the girls. The team took a victory lap through the school, led by the marching band, as they were cheered on by their classmates. Althoff High School in Belleville won the Class 3A champions, beating Resurrection College Prep High School in Chicago. Payson Seymour High School in Adams County won the Class 1A championship. The High School of Saint Thomas More in Champaign won the Class 2A championship.